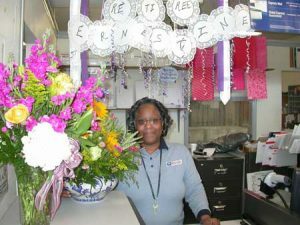 Ernestine Brown’s last day at the Edgefield Post Office was Friday when they celebrated her leaving with a party—food and well-wishing. On Thursday Ernestine posed for The Advertiser photographer, reluctantly, and gave the newspaper a little information that helps us to know her better. He has a son that they are proud of who has graduated from Georgia State and he now works for that school. “People have been great here in Edgefield,” Ernestine says. She is looking forward to a gift from her husband, a retirement gift, which will be a cruise for the two of them to Hawaii.